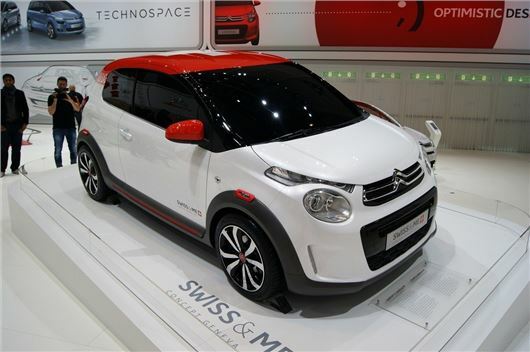 The second-generation Citroen C1 has had its public first airing at the Geneva Motor Show alongside its counterparts, the Peugeot 108 and Toyota Aygo. The new model is less than 3.5 metres long and will be available with three or five doors when it goes on sale. There's also a new open-top version called Airscape. The three-cylinder engine line-up includes a 1.0-litre e-VTi with 68PS that comes with a five-speed gearbox and has engine start/stop. This unit is also available with an automated manual gearbox called ETG - or Efficient Tronic Gearbox. Alongside this is a 1.2-litre VTi with 82PS that averages an official 65mpg with CO2 of 99g/km. The small dimensions of the C1 should make it very manoeuvrable with a turning circle of 4.8 metres. It also gets a lighter rear axle, new suspension springs, new shock absorbers and a new large-diameter anti-roll bar. These changes are designed to improve both suspension comfort and road handling. Personalisation is a big part of the C1 and it comes in eight colours, Caldéra Black, Gallium Grey, Carlinite Grey, Olive Brown, Lipizan White, Smalt Blue, Scarlet Red and Sunrise Red along with the choice of two tone colour options. Two special launch versions are available with different body and roof colours – Olive Brown roof and Lipizan White body. The Airscape is also two-tone and the roof comes in red, black or grey. The interior of the new C1 is designed to be bright and airy and features bright trim colours while door panels also include body-coloured inserts. Storage includes cup holders and a lidded glovebox that can accommodate a one-litre bottle. Boot space is 196 litres compared to 139 litres in the current model and comes with a parcel shelf that folds away when the tailgate is opened. It will be available with some new features like a seven-inch Touch Drive Interface that groups all of the media functions together plus Mirror Screen technology. This allows you to connect your smartphone and mirror the display on the car's touchscreen. The new Citroen C1 will go on sale this summer with prices expected to match the 108 and starting at less than £8500.